Autumn 2017 Canadian Literature Reading China through the Diaspora. June 24, 2017 The Bend Bulletin. Family History the Backdrop of Novel. April 29, 2017 CBC North by Northwest interview; about 38 minutes into the segment. Book Review: "Janie Chang’s second novel is a remarkable read, brimming with magic and the grit of realism ... With this novel, Chang asserts herself as an exciting, relatable voice in Canadian fiction. " Book Review: "Dragon Springs Road is a captivating novel about a Eurasian girl’s journey for identity and self-acceptance in a society rooted in traditional values." A short radio spot. About 4 minutes. Dragon Springs Road reviewed by Ann Else. About 4 minutes. An interview with senior editor Rhonda Dynes. In conversation with Shilpi Somaya Gowda. The Sophomore Novel Club: On the Dreaded Second Book. The Book Report. 5 questions for the author. 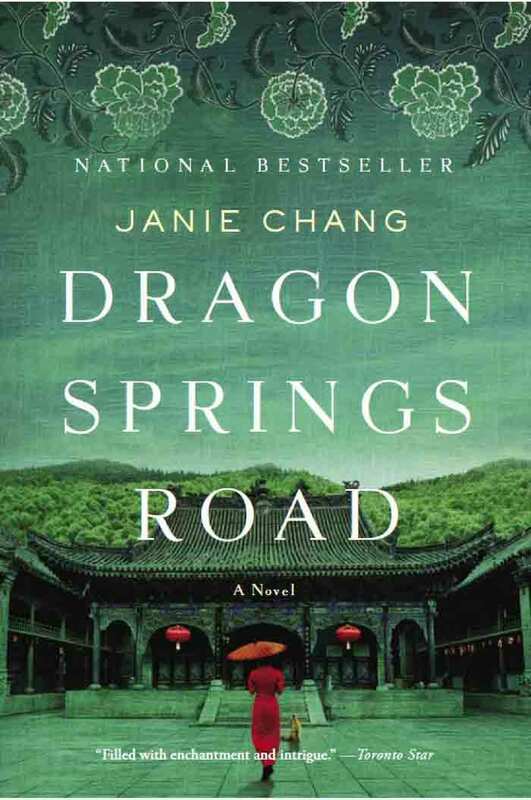 Spotlights DRAGON SPRINGS ROAD in a "Cultural Books" roundup. Ink and Quill, a radio program about books. Author interview. and book review. Book Review. “… Janie Chang’s writing is beautifully interwoven by her extraordinary skill of storytelling … a compelling and intriguing plot, and memorable characters who feel like they would be friends/ family in your life... authentic, rare, intriguing, and worthwhile”. Nov. 15, 2016 Booklist (not online). Book review. "Jialing never thought to question her sheltered existence with her mother alone in a house on the outskirts of Shanghai. But, as she would learn, a Fox spirit at the residence was responsible for suppressing any curiosity she might have about the world outside. After Jialing’s mother abandons Jialing, a mixed-race girl of seven with no prospects for her life but the brothel or a factory, Fox wields her influence to find Jialing a place as a servant with the property’s owners. As Jialing searches for her mother, she feels the constant pressure to determine what she will do once her period of servitude ends. A deadly encounter then sets her life on a new course, and even Fox’s powers are put to the test as Jialing strives to stay safe. Chang unfurls this intriguing story—set against the chaotic backdrop of China in the early twentieth century—with precision. Rich with detail and a fascinating interplay between the spiritual and earthly realms, Chang’s second novel explores whether it is possible to overcome your past."